I just found this video! 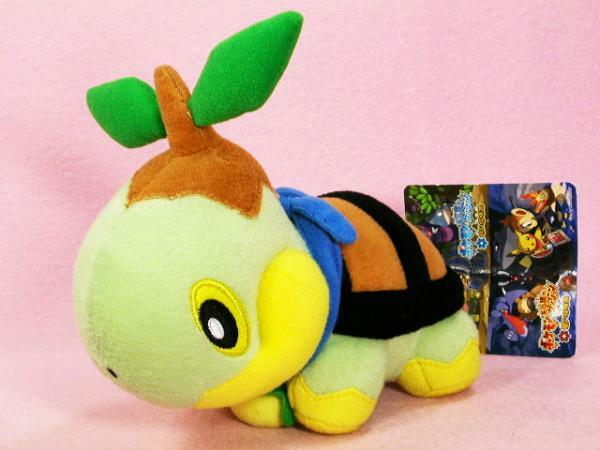 Wonder where the Plusle version is. I thought it was a talking plush but it's a dancing one! 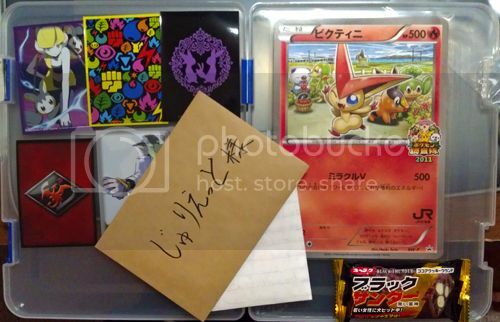 *My pkmncollectors feedback was granted by former mod lineaalba in 2008! I got the super-special-awesome oversized JR promo Victini card in the mail this morning! It came with extras.... creepy extras. First up on the left I got 5 different card sleeves: Elesa with two Emoglas, trainer badges, Umbreon and Espeon, Charizard, and N getting ready to throw down! I also got a candy called Black Thunder... not sure if I want to eat it. Unknown Dungeon has been updated with this lovely school supply set. Please click the picture to enter the shop. As always, please use Ctrl + F to search for the Pokémon you collect. Hello again, pkmncollectors! It's been a while. As you may have guessed, and a few of you know, I've been picking up more and more Mewtwo items, a few of which would definitely count as holy grails here. I've been biding my time, waiting for what I consider the "right" time to post my update - none other than Mewtwo's birthday (February 6th in in-game canon) would suffice. As it is Mewtwo's birthday today, I figured this would be a good time to show my collection in full; I've picked up a good number of new items and have something special to show you all at the end! A sneak peak at a package I received today!!! 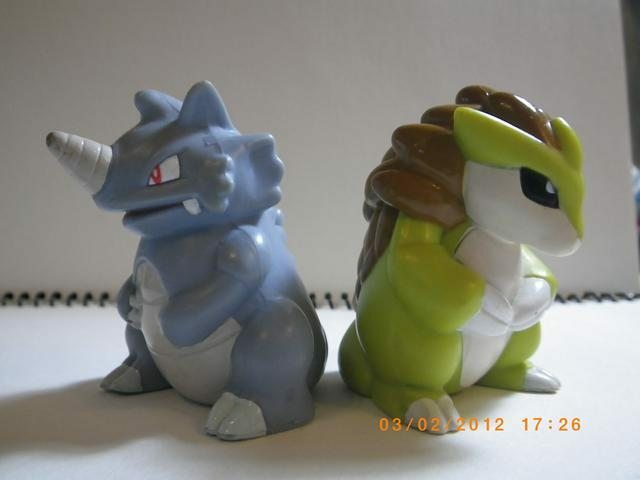 Some Mew pics + possible Totodile figure trade? I just wanted to share some pics of two Mew things I have. First is a Mew plush keychain! I've had it for years, lol. 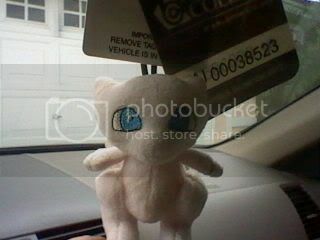 It's from Hasbro and it hangs from the rearview mirror of my car. 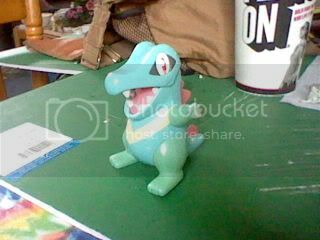 It's also missing its eyebrows (which I removed due to them being loose and distracting XD). What do I want for it? Anything! Just offer me something. I'm kinda expecting a similar condition figure in return, hehe. It's missing some paint on its teeth, as well as discoloration on its arms and legs, but it still squirts and is in good condition! TRADED. 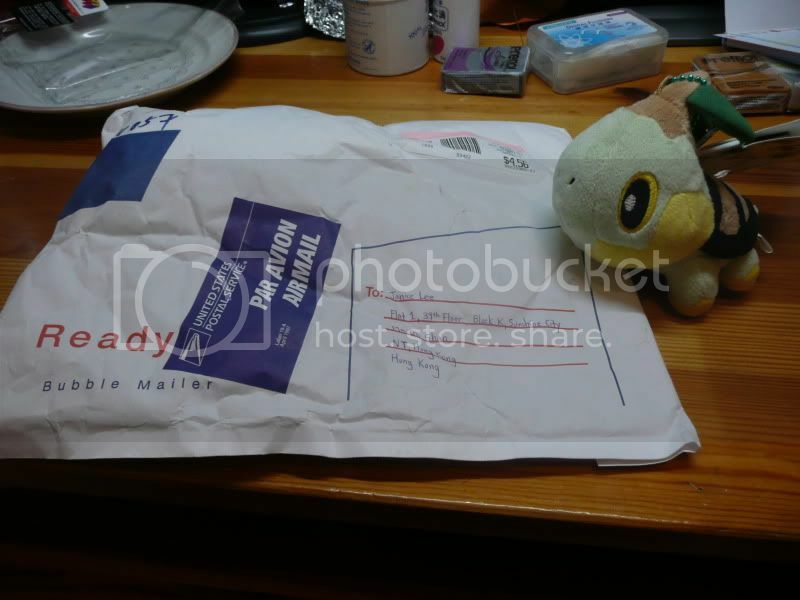 Soooo, I got my Valentine's exchange package today from irethsune! First of all, thank you SOOOO much. I love everything! I told myself I wouldn't collect Japanese TCG - too late. The artwork is so beautiful. x.x And, these will go great with my 692+ cards from vulpixlover! The date on the tush tag says 2008, but the hang tag says 2006. Piplup's beak is a little off, too (that could just be because I'm picky). It might just be the Japanese design (in that case, I like the American version more! x]). 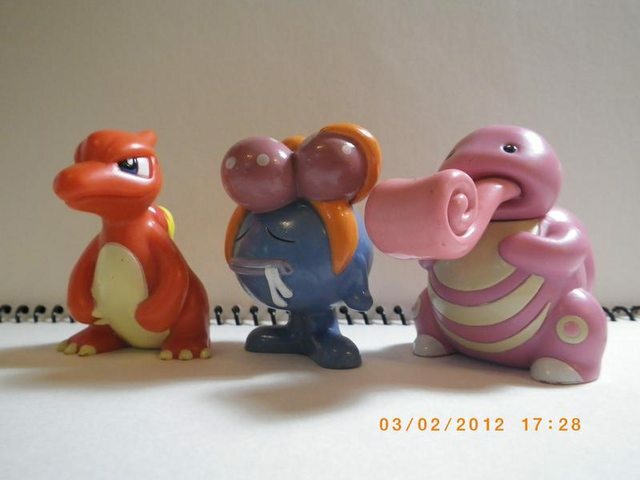 And is it normal for Pokedolls to faceplant? What have I added today? Zoroarks, Absol Primes, Mandibuzz, and Leipard for some! Yes, I took apart a deck and now the cards are for sale. I have one Catcher, 4 Rare Candies, some Holo Energy, and a slew of Double Colorless energies! 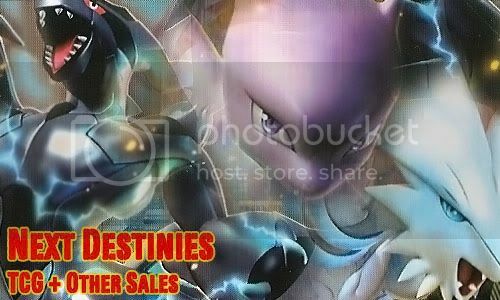 I still have a lot of commons and uncommons from the new Next Destinies set that are not in my sales post. Let me know if you're after anything! Soo.. I got back home today, and this package I have been waiting for finally arrives...... ;u;!!! 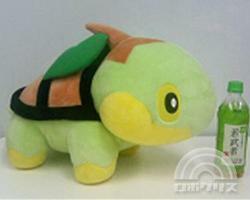 Now to my Naetoru wants <3 Please help me expand my collection! Glowy and KFC offers reminder! 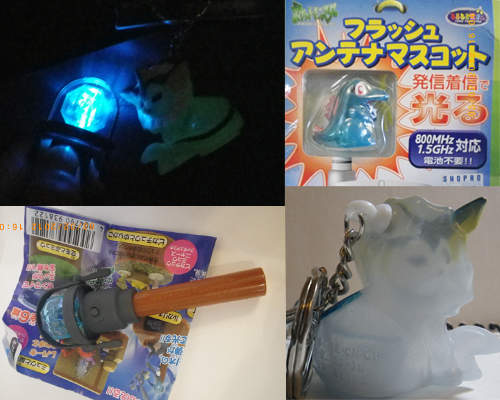 Just a quick reminder that all offers on these glowy items and rare KFC figures will be ended at this Wednesday(8/2), at 12:00 pm, HK time (GMT+8)! This always happens, every time I get a new debit card. It's good for a while and then BAM! Someone else has access to it, somehow. And now, I'm in the negative and have to hit up my bank tomorrow. So, if I've told you I'm going to buy something from you, I'd still like to--I just can't do it as soon as I've said so. If that's too much of a problem, put it back up for sale, and I apologize. 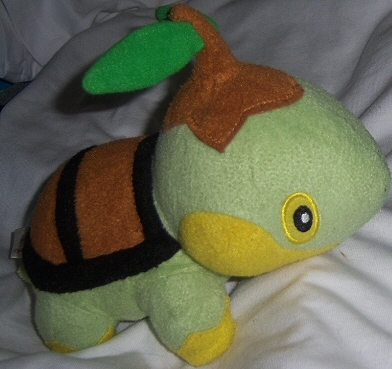 Unrelated--I've been taking my Jakks snivy [whom I named Otter] everywhere with me. But, his tail likes to flop where leaf meets tail and I'd like to strengthen it. Any tips? I have a bunch of stuff for sale and auctions! Sales permission obtained in 2007. *I will hold items for 24 hrs, but please don't put things on hold unless you intend to buy them. *I reserve the right to not sell to you for any reasons such as rudeness to me or other members, bad feedbacks, etc. *Fees will be added upon checkout. is it worth it for the price without the nose? let me know your thoughts plzzz!!!! Also its on my want list so if anyone is selling one plz let me know! OMG I GOT MY HOLY GRAIL (well one of them :P) I have finally got him and he's beautiful!!!! Thanks y'all, hope to hear from you soon! I got everything I was waiting for in the mail today, so that means an update! I also updated the crap out of my weebly site, so check it out if you want! Also, I need an opinion on this: should I change my site to a .net? I'm debating it, but I'm not sure if it really has a ring to it. Would it be easier for people to remember? Anyway, updates under the cut! 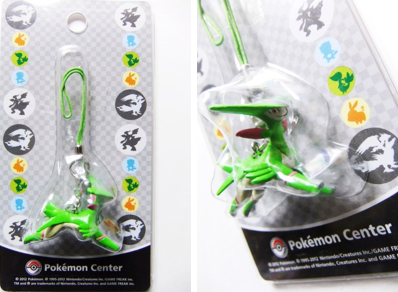 Japanese Pokémon Centers on Saturday released mascot straps of Purrloin, Sewaddle, Lilligant, Cobalion, Terrakion, and Virizion, according to Asami. It doesn't look like these have double-strap variants (that include a thicker plastic strap with the Pokémon's name), unlike some previous releases. Sorry for this boring post, but I have a question about SMJ. I was wondering how long does it take for SMJ to activate my account after I made a deposit. The thing is I just made a deposit like 5 mins ago, but this grail item on Y!J ends in 8 hours. So if they usually take like a day to activate my account, then I am screwed >_<"
So am I worrying too much, and is it likely that SMJ will activate my account in less than 8 hours? And is Noppin the same, in which I would have to wait for them to activate my account? Thanks in advance! I appreciate it! I've recently begun collecting the Japanese Pokemon VS Card Series. Very cool artwork, and very hard to get. I had a bit of luck and came across the very rare 'Rocket's Tyranitar' (pictured below). Does anyone know where I can find the value of this card. I've searched everywhere! Thanks! I just wanted to share a part of my collection. I finally got all my legendary dog kids! BUT I'M STILL SUPER EXCITED. Here's a quick picture of them on this awesome plate I found on sale at Target!